Howdy! My name is Clay Nichols. I am from Cheyenne Wyoming in the United States. I am currently a student at Texas at Texas A&M University studying Anthropology with a directed study toward Archeology. 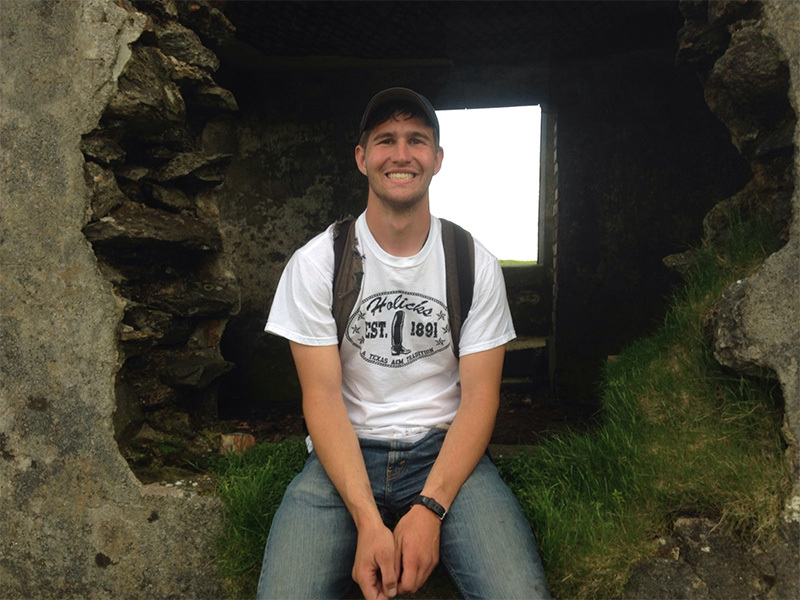 Over this past summer I have been at Achill Archeological Field School in Ireland. I came to Achill to learn the process of an archeology excavation and further my knowledge of archeology in general. This has been very exciting for me because I have never worked on an archeological excavation before. Everything that we have been learning is only barely familiar from hearing about in lectures, but it is like almost everything else in life, that it does not really make sense until you actually do it yourself! This week was an interesting one. I have been working in Quadrant 4, which is the second, and most northern trench that has been excavated on the site so far. It has been very interesting because the stratigraphy of the trench is full of different colors and patterns which is exciting because it means there was probably high activity, but at the same time confusing because we haven’t untangled the individual contexts yet! So to find out a little more about what we are digging, I started to dig something called a sondage. This is a deeper trench cut into the existing trench. It is an exploratory cut, and is only 40 cm wide and about a meter and a half long. Digging out this sondage yielded some interesting information. Based of the color changes in the soil, we could see that there were two pits and a posthole dug into the earth during the occupancy of the site. Outside of the sondage we also found a peculiar line of stones running across one corner of the trench. We weren’t sure why they were there. Was it possible they were just collapse from the building? Or were the stones part of a small wall or some sort of structure? Later in the week we removed them to discover that the underlying soil was from a later date than occupancy of the site, so after recording the line of stones they were removed and we continued excavating the deposits below them. On Wednesday we took our weekly field trip. It was to an island just off the southern coast of Achill called Achill Beg. I learned later that beg means “Small” in Irish, so the name literally means “Little Achill”. This trip was one of my favorite tours that we have taken. Since the island was separated from Achill by a swift flowing stretch of water called a sound we had to take a boat to cross to the island. The boat we took over looked as if it was an artifact in itself, and riding in it you couldn’t help but think about how cold the water is going to be when the boat spontaneously fall apart in the water. Nevertheless though we made it safe! Once we got across it was explained to us that the island was abandoned. It became abandoned in the second half of the 20th century, something that happened to a lot of the small islands around Ireland between the middle of the 19th century and the middle of the 20th century. Even though no one lives on the island full time there are an abundance of summer homes that families will stay at for short periods of time while on holiday. One of the coolest things that we saw on the island were Iron Age promontory forts. We saw two on the island and a few more along the coast of Achill itself when we drove along the Atlantic Drive going towards Achill beg. On Friday we had our first lab day. It took a couple hours in the morning to get used to the AutoCAD system, which is very complicated, but once we learned the basic tools that we needed we worked fast. What we had to do was take the drawings that we had taken in the field, and trace everything on AutoCAD to create a digital copy of the site. This was a bit tedious as we had to slowly trace over every rock and line, but finally we got to a point when we could all see how good the drawings were looking and were very happy with the results! This has been a great experience; the teaching has been very easy to understand and wonderfully delivered. The other student have been incredible to work with and I hope I can have the opportunity to work with them again!